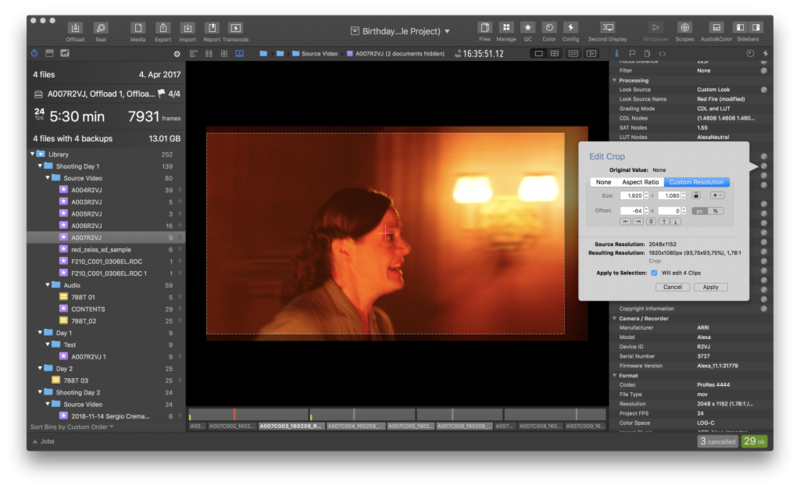 Silverstack allows to crop clips to a custom aspect ratio. 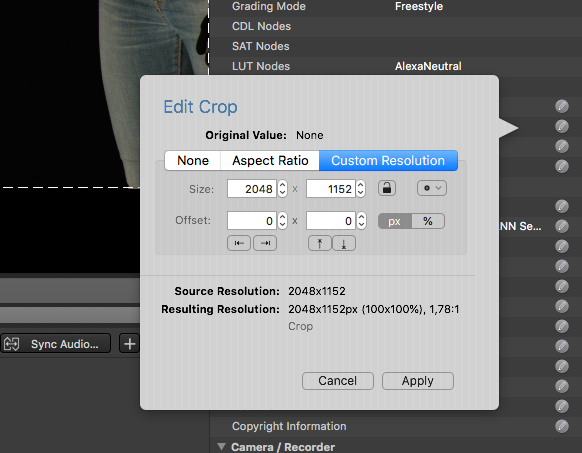 Cropping is non-destructive as long a crop setting is not used for transcoding. Cropping can be set via the “Crop” popover in the General Info tab on the right side of the main window. Learn more about the right sidebar in the article The Information Panel. Go to the “General Info” Tab and scroll down to the “Processing” section where you can find the “Crop” entry. 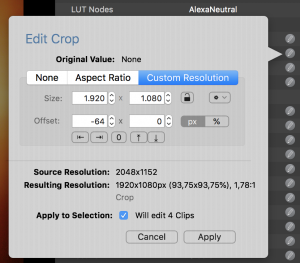 Selecting “None” and clicking “Apply” will make sure to remove all crop settings from the selected clip. Select the second tab “Aspect Ratio” and enter a custom aspect ratio into the combo box or select one from the list of presets. Select the third tab “Custom Resolution”. Size: You can enter a custom pixel resolution to crop to. The specified pixel resolution will be cropped out by default from the center of the image. Aspect Lock: You can lock the resolution to a certain ratio when changing horizontal or vertical size. Quick Offset Buttons & Re-Center: The quick offset arrow keys enable a one-click shift of the cropped area to the respective image margins. If an offset is entered the “0” button appears and helps to remove the offset to re-center the cropped area. 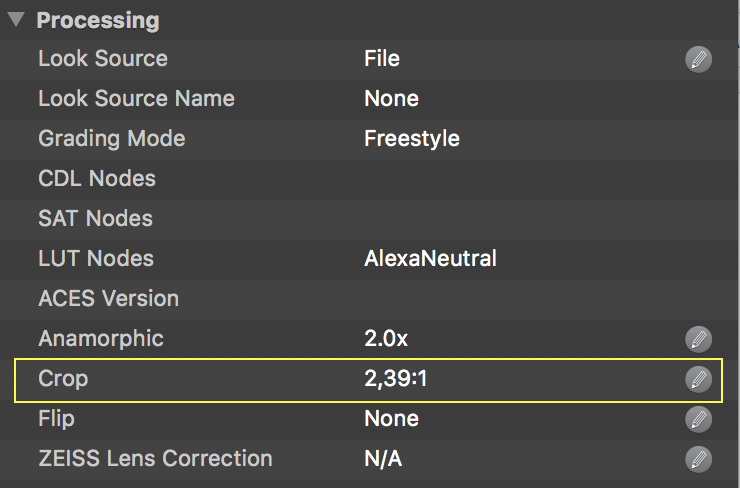 px/% Switch: You can switch between specifying an custom crop resolution in pixels or percentage values. Click “Apply” to crop the current image to the specified crop. “Resulting Resolution”: The cropped and/or desqueezed resolution. The factors relevant for the calculation of the Resulting Resolution are displayed below (e.g. “Desqueeze (2.0) and Crop”). The resulting percentage of the original image is displayed in brackets. The resulting aspect ratio follows. Please be aware that the decoding resolutions of the player do not affect the calculations of resolutions in the “Crop” popover. While setting the crop in the popover the area that will be cropped is highlighted in the playback view and updates live while changing crop settings. The number of altered clips is displayed in the popover (see “Will edit 4 Clips” in Fig. 6) . 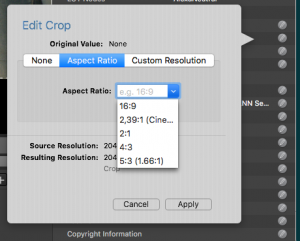 Click “Apply” to apply the set crop factor to all selected clips.